The handset that is believed to be the compact (and less potent) version of the Samsung Galaxy S9 flagship has just been spotted on Geekbench, where it is listed under the model number SM-G8750. This handset is rumored to be currently tested in China and features 4 GB RAM and a mid-range Qualcomm Snapdragon 660 processor. Although most flagships are between 5.7 and 6 inches in size, there is still enough interest in compact yet powerful phones that sport a 5-inch display, or even 20 percent smaller, as in the case of the — now discontinued, unfortunately — popular 4-inch iPhone SE. These being said, the arrival of a compact Galaxy S9 would be great news for many Samsung fans, and it looks like the tech giant based in South Korea is now testing such a handset already. According to Nashville Chatter, the Samsung SM-G8750 that recently surfaced on Geekbench is going to hit the market as the Galaxy S9 Mini. This does not sound like anything new, since in each of the last few years we bumped into at least one rumor about a compact version of the Galaxy flagship, but none of those handsets came to life. However, this time the SM-G8750 is supposedly being tested in China and the Geekbench listing reveals three key elements: the Qualcomm Snapdragon 660 mid-range processor, 4 GB of memory, and the Android 8.0 Oreo mobile operating system. 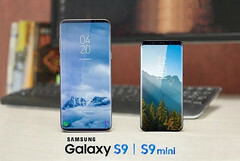 The benchmark scores of the alleged Galaxy S9 Mini — 1,619 single-core and 5,955 multi-core points — place this handset on the same level as the Nokia 7 Plus and the iPhone 7. The problem is that, for now, nothing is official, so Samsung might be testing a completely different handset after all. We will get back to it as soon as we hear anything new, but in the meantime feel free to drop a comment and let us know if you would consider buying the Samsung Galaxy S9 Mini.